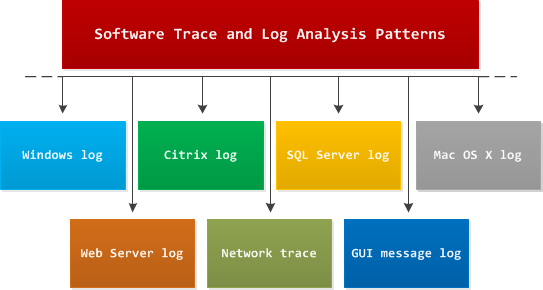 Software log analysis patterns from Software Diagnostics Institute are independent from any OS, platform or product because they are based on viewing software logs as stories of computation and were discovered by application of narratological analysis (software narratology). In addition to these patterns there exist domain specific problem patterns such as wrong hotfix level or specific product error code during software installation or execution. Typical examples of support for such platform and product specific type of patterns include Microsoft Windows Problem Reporting and Citrix Auto Support.